For a more efficient system and a clean engine compartment look, upgrade all of the air conditioning system under the hood. 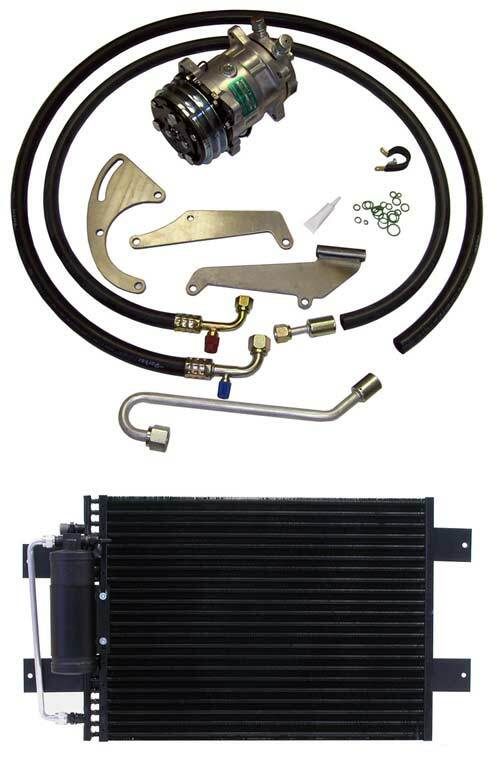 Classic Auto Air’s Engine Compartment Upgrade Kit uses a high-performance condenser and compressor to connect to your classic’s original factory AC interior air conditioning components. Why Upgrade Your Engine Compartment? Modern systems are more efficient. Classic Auto Air’s high performance Engine Compartment Upgrade kit takes the Compressor Upgrade Kit to the next level by upgrading the condenser and all of the hoses as well. Converting to 134a? You get everything you need to convert to 134a except the refrigerant itself. More on Converting to 134a! Modernize the appearance of your engine compartment. The smaller & cleaner look of the Sanden-style compressor combined with Classic Auto Air’s Perfect Fit series condenser and pre-formed tubes are designed specifically to fit your stock application. Not only does it fit properly, but it looks good too! Save Horsepower. The Sanden-style compressor draws significantly less horsepower than a stock Ford compressor. As little as 2-5 horsepower, compared to 10-15! Save Weight. The Sanden-style compressor is significantly lighter than a stock GM compressor. Increase Fuel Economy. Less horsepower draw means better gas mileage. Running Engine at high RPM? The Sanden-style compressor can handle 6000 continuous RPM! Stock compressors can handle much less. Build up your engine and rev it up to leave someone in the dust and your stock compressor could lock up. What Is An Engine Compartment Upgrade Kit? An engine compartment upgrade kit uses an efficient, modern Perfect Fit™ condenser & rotary compressor to connect to your car’s original factory a/c evaporator unit in the engine compartment. All hoses will be sent with one end pre-crimped. Once installation of condenser & compressor is completed, hoses will simply need to be cut to the proper length and have the supplied fittings crimped on. Can I Install this Kit Myself? Charging the system, however, should be performed by a professional. Custom Kits for other GMs, just contact us.